Studies of physics in Frankfurt and at the Ludwigs Maximilian University Munich 1966-1970. Diploma in physics at Ludwigs Maximilian University Munich 1970, Ph.D. at Bonn University 1972. 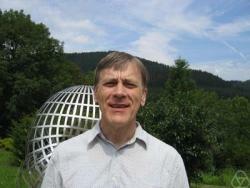 Postdoc at Bonn University 1972-1975, fellow and staff member of CERN 1976 - 1982. Heisenberg fellow at Bonn University 1982 - 1986. Associate professor at UC Davis 1986 - 1989, full professor at Bonn University 1989 - 2002. Since 2002 senior professor at the Dublin Institute for Advanced Studies, and director of the School of Theoretical Physics. Fellow of the Royal Society.